Why Should I Sell My Minerals? How Many Net Mineral Acres Do You Own? EOG Resources has discovered a new oil play in Laramie County, Wyoming in the greater Silo Field. It was originally thought that the Niobrara Shale Formation was going to be the primary target by EOG in Laramie County. It now is very clear that the Codell Formation is acting as a better reservoir and is yielding exceptional results. Mineral and Royalty Owners in Laramie County should consider selling their mineral rights and royalties to 1280 Royalties. Call us today for an offer to purchase your mineral rights and royalties in Laramie County, Wyoming. We will also consider purchasing non-operated working interests with EOG. For the city, see Laramie, Wyoming. Wyoming’s location in the U.S.
Laramie County is a county in the southeastern corner of the U.S. state of Wyoming. As of the 2010 census, the population was 91,738 making it the most populous county in Wyoming. The county seat is Cheyenne, the state capital. The county lies west of the Nebraska state line and north of the Colorado state line. Laramie county comprises the Cheyenne, WY Metropolitan Statistical Area. The city of Laramie, Wyoming actually lies in neighboring Albany County, Wyoming. 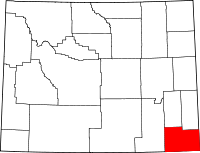 Laramie County was originally created in 1867 as a county within the Dakota Territory. The county was named for Jacques La Ramee, a French-Canadian fur-trader. In late 1867, Laramie County lost territory when Sweetwater County was created. In 1868, Laramie County also lost territory when Albany County and Carbon County were created. Laramie County became a county in the Wyoming Territory when the territorial government was formed in 1869. Crook County was created with land ceded by Laramie County in 1875. A few years later in 1888, Converse County was also formed from a portion of Laramie County. In 1911,Goshen and Platte Counties were formed from another part of Laramie County, and at that point the county achieved its current boundaries. Many of the early occupations in the county were agriculturally based. The best known example would have to be Cattle farming, the Wyoming Stock Growers Association is one remaining example of this. However other animals were also raised. Americans and foreigners were both attracted out over time, with places such as Burns being German immigrant filled early on. According to the United States Census Bureau, the county has a total area of 2,688 square miles (6,960 km2), of which 2,686 square miles (6,960 km2) is land and 1.6 square miles (4.1 km2) (0.1%) is water. As of the census of 2000, there were 81,607 people, 31,927 households, and 21,614 families residing in the county. The population density was 30 people per square mile (12/km²). There were 34,213 housing units at an average density of 13 per square mile (5/km²). The racial makeup of the county was 88.92% White, 2.60% Black or African American, 0.85% Native American, 0.95% Asian, 0.11% Pacific Islander, 4.00% from other races, and 2.57% from two or more races. 10.90% of the population were Hispanic or Latino of any race. 23.7% were of German, 11.1% English, 10.3% Irish and 7.4% American ancestry according to Census 2000. There were 31,927 households out of which 33.20% had children under the age of 18 living with them, 53.90% were married couples living together, 9.90% had a female householder with no husband present, and 32.30% were non-families. 27.20% of all households were made up of individuals and 8.90% had someone living alone who was 65 years of age or older. The average household size was 2.45 and the average family size was 2.98. In the county the population was spread out with 25.80% under the age of 18, 9.60% from 18 to 24, 30.50% from 25 to 44, 22.70% from 45 to 64, and 11.50% who were 65 years of age or older. The median age was 35 years. For every 100 females there were 100.90 males. For every 100 females age 18 and over, there were 100.00 males. The median income for a household in the county was $39,607, and the median income for a family was $46,536. Males had a median income of $31,644 versus $24,406 for females. The per capita income for the county was $19,634. About 6.50% of families and 9.10% of the population were below the poverty line, including 12.00% of those under age 18 and 6.50% of those age 65 or over. ^ Jump up to:a b “State & County QuickFacts”. United States Census Bureau. Retrieved January 25, 2014. Jump up^ “Find a County”. National Association of Counties. Retrieved 2011-06-07. Jump up^ Long, John H. (2006). “Wyoming: Individual County Chronologies”. Wyoming Atlas of Historical County Boundaries. The Newberry Library. Retrieved 2011-09-01. Jump up^ Urbanek, Mae (1988). Wyoming Place Names. Missoula, MT: Mountain Press Publishing Company. ISBN 0-87842-204-8. Jump up^ Herman, Marguerite. “Laramie County, Wyoming”. Wyoming State Historical Society. Web. Accessed April 17, 2014. http://www.wyohistory.org/encyclopedia/laramie-county-wyoming. Jump up^ “US Gazetteer files: 2010, 2000, and 1990”. United States Census Bureau. 2011-02-12. Retrieved 2011-04-23. Jump up^ “U.S. Decennial Census”. United States Census Bureau. Retrieved January 25, 2014. Jump up^ “Historical Decennial Census Population for Wyoming Counties, Cities, and Towns”. Wyoming Department of Administration & Information, Division of Economic Analysis. RetrievedJanuary 25, 2014. Jump up^ “American FactFinder”. United States Census Bureau. Retrieved 2011-05-14. Hallberg, L.L. and J.P. Mason. (2007). Selected hydrogeologic data for the High Plains aquifer in southwestern Laramie County, Wyoming, 1931-2006 [U.S. Geological Survey Open-File Report 2007-1069]. Reston, VA: U.S. Department of the Interior, U.S. Geological Survey. Wikimedia Commons has media related to Laramie County, Wyoming. This page was last modified on 30 July 2014, at 21:30.